As I approached the checkout aisle yesterday at Costco, this little box of treats caught my eye. I put it in the cart, then took it out and proceeded to the checkout. 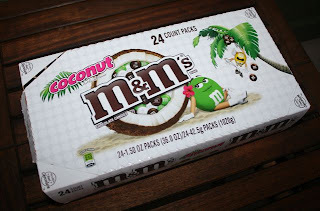 Still thinking about what the coconut m&m's might taste like... I made my way back for a box. HOW COULD I NOT BUY THEM? We are CUCKOO FOR COCONUTS after all! They aren't bad and taste a little bit like Mounds candy bars... without the chewy coconut. I actually think the packaging is pretty good and I like the bright white with the hot pink accents. It feels fresh and tropical. 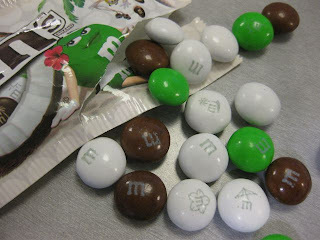 The brown m&m's in the tree are a cute touch, but coconuts have a green outer shell and brown inner shell. I'm just sayin'. The graphics of beach umbrellas, palm trees and hibiscus printed on each could be a bit easier to see though. They really only show up on the white ones and the brown seem to only come with m's. I'm such a sucker for something old in a new package or that has been given a new taste sensation. Sometimes it doesn't always work, but I (we) give these two (four) thumbs up. will be on the lookout. . .or are these strictly a HI thing i wonder?? those showed up in some shops in brooklyn last spring - i bought pretty much all of them i could find! Could this be better than the McCoconut Pies?? I want some... I LOVE coconut:-) Save some for me!!! deb... i would be on it but we ate them all. robert: the website says new and limited time... hmmm. anonymous. how can i save them for you if i don't know who you are? besides... we done ate'm all. Crazy I never knew this and I was just at M and M world in Las Vegas over the weekend and went crazy for the almond ones. Coconut I have never seen!